I think it goes without saying that the current framework and service standards in Singapore's insurance industry is SORELY lacking when it comes to addressing consumer needs. That's why many of us struggle and still don't have adequate, nor the best plans, for our needs. Most disclosed basic information about products recommended i.e. whether it is meant for protection, savings or investments, BUT disclosures on risk / amount and frequency of fees and charges / warnings / exclusions and other caveats were omitted! BB: Yup. No wonder this post of mine continues to do well and receive reader emails up till today. I also get regular emails from many readers asking me for help on how to read their BIs because their agents didn't bother explaining it to them. This shouldn't be happening - why are folks trusting a complete stranger (me) to ask about insurance instead of their agent? The top three categories of products recommended were endowments, unit trusts and investment-linked life policies, which the industry panel assessed to be unsuitable. BB: I don't like either of the three either, for reasons I've explained on this blog before. They're suitable only for a VERY select group of people, but have been grossly mis-sold to the masses in my opinion. This needs to be changed. And although some improvements have been made since (for instance, there's a more comprehensive needs assessment survey that consumers need to filled up before purchasing any insurance policy now, but I still feel most agents I've seen do it in a very slipshod manner today just to "tick the boxes"), but if you ask me, they're still not enough. 1. Poor advice continues to be dispensed that are ill-suited to the consumer's life and financial circumstances. 2. Products with the highest agent-commissions continue to be pushed. 3. There are still glaring protection gaps left unresolved. 4. Many consumers continue to overpay for their insurance policies. Unfortunately, I think we have a very real ticking bomb on hand, and if something is not done to address these issues soon, they will only escalate into something bigger and more painful. We consumers will pay the price. Despite this, I'm not idealistic or naive enough to believe that everyone can and should now DIY their own insurance. 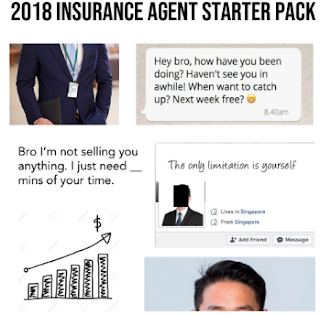 If you're financially-savvy and make an effort to read up, and you're self-aware of your own needs and limitation, then there really is little need for you to go through an insurance agent (unless you just want the convenience of calling up someone for your claims when something happens). But the sad truth is, most people aren't equipped or confident enough on these two fronts. And while I fully advocate financial literacy and self-improvement (especially so you can smell the crap that your insurance salesperson is telling you), for many people, it may be too late to wait until you're financially-savvy before you purchase insurance. This is largely due to something called exclusion clauses and pure bad luck. You don't want crap to hit the fan only to find out you're uninsured and have to bear the financial costs yourself, do you? I was recently hospitalised for a bad fall during my third trimester of pregnancy, but thankfully because I've gotten for myself hospitalisation + personal accident + maternity insurance, I had all my grounds covered and didn't have to worry too much about my hospital bill. Otherwise, the 2 days I stayed in hospital would have easily wiped out more than a month of my salary! But the problem is, how do you know what you DON'T know? You trust that your agent is working in your interest, when in reality he/she might be thinking of and prioritising their livelihood instead. That's why problem #2 exists, and I've shed some light on how much commissions agents earn here previously so you understand why some products are pushed more than others. My Experience as a DIY Consumer for Maternity Insurance - Meh! When I was shopping around for maternity insurance previously, I realised that there was very little information when it came to quotes and benefits cover among the different insurers. As a result, I had to meet individually with agents from every single company, which took up A LOT of my time. How many consumers will go to the extent of doing the same? (Psst, you can benefit from my hours of sweat and research though, and see the results of my efforts in this comparison table of Singapore's maternity plans here (2018 edition). Guess what I encountered during these sessions? Lots of hard-selling to upgraded plans, each agent claiming their product was THE best (only 2 were objective enough to admit theirs wasn't the best for what I needed) even when it wasn't, too much time wasted telling me about their expertise / credentials / MDRT status -.- and too little time properly going through the policy details and caveats, etc. I hated the experience. Some didn't even understand how their plans compared against the other options available by their competitors! I grew frustrated when I said no to one particular tied agent, only to have him shoot me back about how I'm missing out because his plan is THE best. To shut him up, I had to justify and educate him on why his plan was NOT better than another using facts and direct comparison of features. Hello!? Who's the agent and consumer here ah?! I don't disclaim that his plan may be the best for someone else in a particular situation, but to claim that it is THE BEST among all? Oh please! Another even had the balls to tell me I was WRONG in not wanting a tied-ILP because he generates over 30% of returns annually and consistently for his clients. Wow! Even better than Warren Buffett sia! Just take my money already! They met a terrible consumer in me because I clearly KNEW what I needed and wanted. So I didn't fall for any of their sales pitches. But how many consumers have / would have? The information asymmetry in the insurance space makes it hard for us consumers to really be fully educated on what our options are. And when we don't fully know or understand our options, it is hard for us to make an informed choice. So we rely on our financial advisor(s) for this. But how many of us have then found out that we misplaced our trust? I've trusted one too many advisors to make the right and suitable recommendations for me on many occasions, but most have only left me disappointed. YOU HAVE UNCAPPED INCOME POTENTIAL. PASSIVE INCOME! EARN FOR YEARS EVEN AFTER YOU'VE SOLD! MILLION DOLLAR ROUNDTABLE (MDRT) YO! this is how many sell you the "dream". There is NO such thing as the BEST insurance. Instead of looking for THE BEST, you should really be looking for "the best for you". Even among all the different Integrated Shield Plans available, there are pros and cons tagged to each. Which "pro" do you value, and which "con" do you really not want? Everyone has different needs and that's why all the different policies co-exist. And that's why I feel financial advisors will still always be needed. While robo-advisors may help to plug the gap through a preliminary needs analysis, they still won't be able to do the human job of discerning between the qualitative factors that make one insurance policy more suitable for a client over another. Insurance is, after all, a human business. Can I DIY My Insurance? DIYInsurance : founded in 2014 to address the gaps in the MAS industry report. You can buy directly through them as their staff (agents) will help you through the process and paperwork. Also provides financial advice if you need additional clarifications or support, or simply want to hear a second opinion. 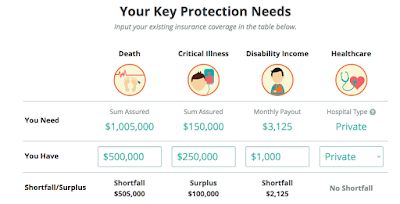 I've reviewed both before a few years ago on this blog as well, but have recommended DIYInsurance over CompareFIRST to many of my friends and readers because not everyone may be savvy enough to go without financial advice. And while DIYInsurance has done pretty well on several fronts, there are also areas where I think they can still improve on today. 1. You can compare among different plans and purchase directly. Rather than having to meet with an insurance salesperson and subject myself to their hard-selling tactics, I can simply go online and check DIYInsurance's portal to estimate how much it'll cost me if I were to purchase this for myself. Once I've made my decision, I can engage one of their staff to help me through the paperwork and application process without worrying that they are going to upsell me something else. CompareFIRST also offers this same benefit, but where CompareFirst falls short is that it couldn't offer me up to 99 years cover (I could only get quotes for up to 65 and 75 years old), I cannot buy directly through the platform, and it doesn't help to guide the clueless consumer on what to buy. I've also detailed these shortcomings here in a previous article. 2. No conflict of interest as their advisors are salary-based and not commissions-based. And that's why they don't upsell, nor see the need to upsell. When one's livelihood is no longer pegged to the policies they sell, it allows for greater objectivity and focus on truly meeting the consumer's needs. I can attest to this, as I mystery-shopped on their website before. Here's a previous email I exchanged with one of their advisors, which I greatly appreciated. See the highlighted section in red? 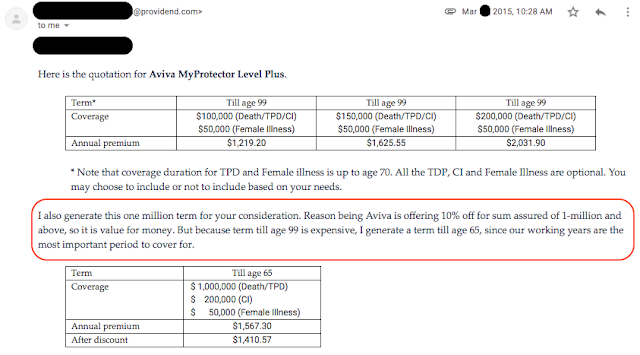 I went to them for a 99-term quote, but their advisor went above and beyond to show me for 65-years to consider as well, while at the same time informing me that I could get more bang for my buck for a higher term cover for lesser premiums as well if I wanted to. I really appreciated that. 3. They advocate what I feel are the "right" ethics. Prior to DIY Insurance, the only folks who were publicly advocating term insurance over whole life insurance were the financial bloggers and some consumers. You'll realise that no other insurer really openly and vocally stands up for this. In fact, since 2003 when Providend started publicly advocating the merits of term insurance in local media like BT and The Straits Times (here, here and here), they were attacked by many advisors who insisted whole life was better (ha!). I've also previously shared about their e-book highlighting the difference between term and life insurance here. I won't deny that whole life insurance still has a place for certain profiles of consumers, but I will also readily tell you that term insurance is so much better when you BTIR (buy term invest the rest) as an alternative to whole life. It is not only much cheaper (sometimes up to 10x cheaper!) but also yields better results compounded over time. 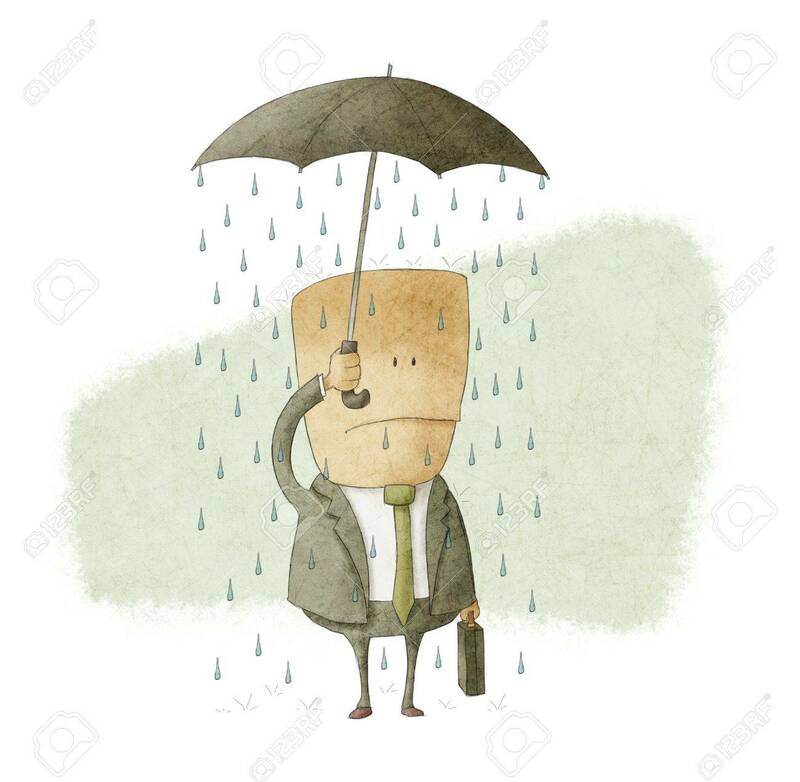 DIY Insurance sells both, but is open and transparent about your options and alternatives so you can decide for yourself (vs many agents I meet who keep pushing whole life only -.-). 1. Quotes are not exactly specific. The parameters can still be quite limited - for instance, I could only choose up options of $200k or $300k for a death + CI quote. But as you know, many insurers offer "accelerators" or "boosters" for you to get a higher coverage during a specific term. The current platform is still far from addressing all these nitty gritty differences between policies as it is not always a straightforward comparison. This is why I still go the long route sometimes through IFAs to obtain more accurate quotes for myself to compare. Also, many of the platform's quotes are also estimates, so the current offering doesn't fully address the issue of information asymmetry. If you want an exact quote, you'll have to reach out to their advisor to generate one for you, like I did. 2. Only insurance products (and also limited offerings). You can purchase whole life insurance, term insurance, critical illness plans, disability income and endowment plans (for retirement and your children's education) from DIY Insurance right now, but there are still other products that I feel they can afford to add, especially when their parent company Providend offers so much more to their clients. Some examples include maternity insurance and lifelong annuity plans, just to name a few. 3. More integration of technology please. 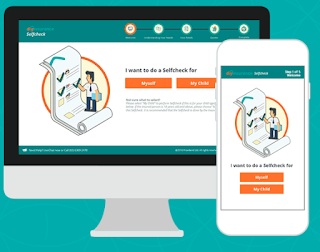 I quite like DIY Insurance's SelfCheck tool which they launched in end 2016. 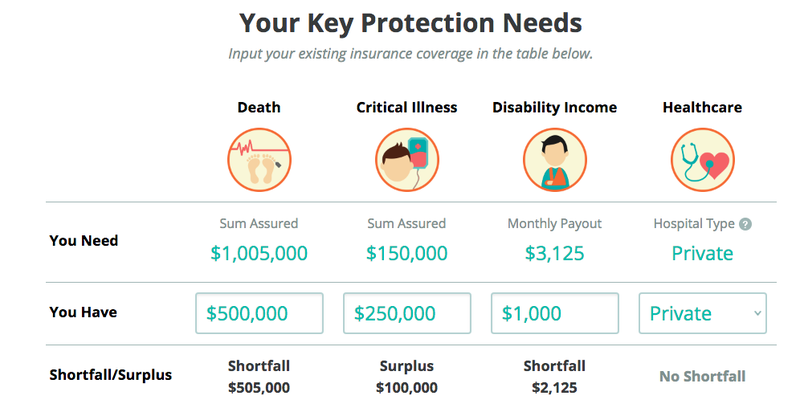 You basically fill up some fields and let the tool assess your insurance shortfalls. While this is helpful, it'll also be great if more parameters were considered like the ones I've mentioned above. And although I keyed in dependents to provide tertiary education for, I was surprised to see that no education endowment fund was suggested to me. We already have robo-advisors for our investments. What about doing more for our insurance? Since I know Christopher personally (CEO of Providend and DIY Insurance), I highlighted my feedback to him over lunch last week and he mentioned that they're also aware that they're not perfect. What's promising is that they've been working on a solution to address these gaps, and shared with me that at the end of the month, they'll be rebranding and doing a new launch. I certainly hope I won't be disappointed, and you can be certain I'll review it when it comes out. I'll give credit where improvements are made, but if it's no good, I won't hesitate to criticise it either. Disclaimer: This post is sponsored by DIYInsurance, but all content and all opinions are that of my own, as you can clearly see from all my remarks scattered across the different points, ha!